“I’m the R in WAR” is a classic. And the fact that he’s perfectly fine with that is great. Over the years, it has been rare that I would read non Astros coverage unless there was some tangential reason to do so. The Athletic coverage is so good, I find myself branching out quite a bit and it’s enhancing my enjoyment of the game. The writing is just great. Good example is Stark’s “totally useless info” series. This weeks version has a hilarious interview with Erik Kratz after he caught all 18 innings of a game last week. True or false: McHugh is a better starter for having spent a year in the pen. That it having time to kill when he was recovering from injury in ‘17 to learn the slider grip and play around with it. Putting one between the numbers right after a GS is a bad look. It seemed to get away from Hendricks. He was wincing as soon as he released the pitch. Yeah baybeeeee. Bergs with the slam! He just about got it in the throat. That Mattress Firm slo mo at the end is ridiculous. First time seeing White in person this year. He lost a bunch of weight last year and got in decent shape. Did he gain it all back? Have not been able to figure out Blue’s strike zone yet. You're not going to see many catches better than those two. +1. The Chapman catch was excellent. I wish I could be there with y’all! Trent Thornton, of Fresno (AAA) fame last year and traded to the Blue Jays for Díaz pitches five innings, allowing two hits, no runs and striking out 8 (!) in his MLB debut yesterday. Good for him. Very cool! I didn't understand the positioning one, though. For example, here's a flyout to Springer. Each position starting point is the small circle and the big circle is the player position when the play ended. In this example, Springer moves like a foot since he is so well positioned and the center fielder instinctually moves a few steps to right to cover. Red line is the path of the ball. 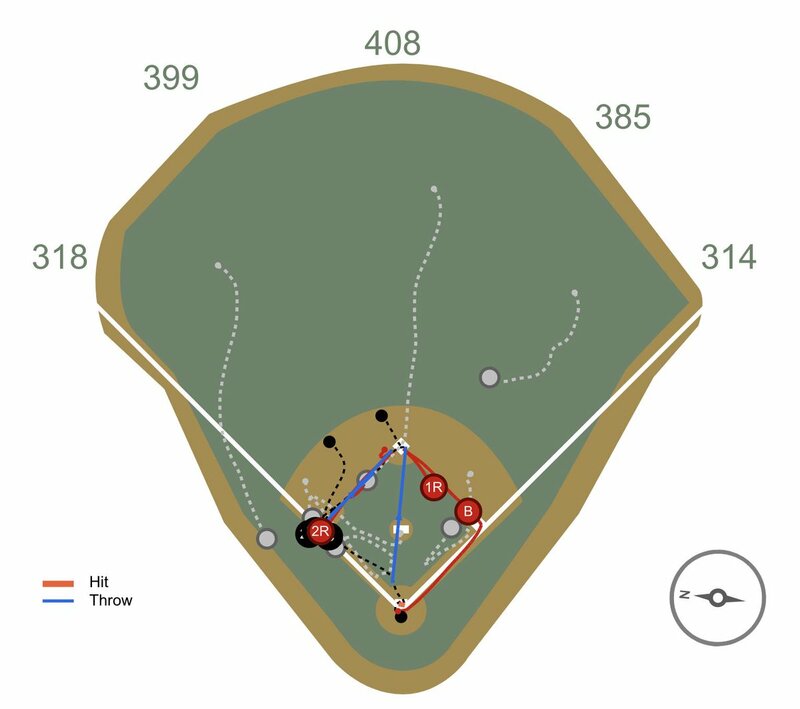 In this scenario, it's a rundown so the player positioning over time is much more complex with the left fielder covering third base and the center fielder sprinting in to back up the rundown. Not as good as Pitching Ninja (yet) but interesting for sure. It's from the head of MLB Baseball R&D. Lots of Astros info in the feed from yesterday. 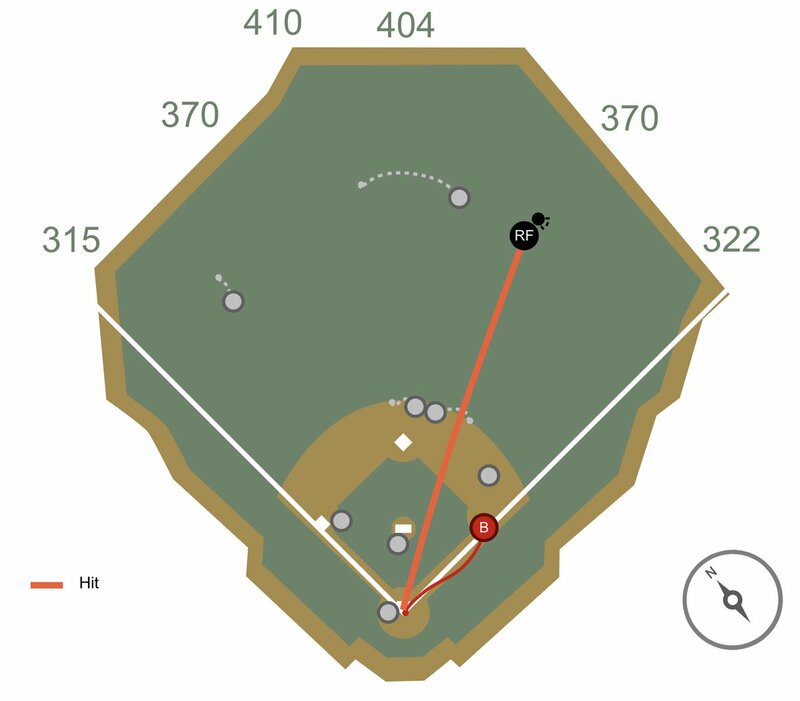 Statcast-generated views of things. I especially like to see the field positioning diagrams as plays (like a rundown) develops. I can see why Budgirl didn't want to do it anymore. Everyone is so quick on the draw. The first pick is official as long as the OWA timestamp starts with 2. Talk Zone / It’s Opening Day!!!! T-Minus 8 hours until The Void is over. How will you be watching/listening to the Astros today? I’ll be at an airport watching on MLB.tv then dark for probably innings 2-6 while in the air then back online as soon as the plane touches down. I’ll likely actually pay for inflight WiFi so I can follow aLong in the GZ during those middle innings.